The EnergyPro is a major step up from our hugely successful SPC Pro data logger, and is designed for the user who needs to do more than measure and manage their energy and carbon, although of course it can still carry out that role with ease. In addition to providing full 6 channel current and voltage measurement on 3 phase supplies, the EnergyPro also provides a full THD (total harmonic distortion) and harmonics measurement (to the 16th multiple) capability, as well as on-board calculation of current and voltage imbalance. As you would expect, it's also highly accurate, and like all Elcomponent data loggers, remarkably easy to use. It ships with the 'PowerView' software package which has been carefully tailored to provide both basic energy management data and potentially complex power quality information in a simple and straightforward manner. THD profiles, harmonic bar charts and waveform presentations, are all available at the click of a mouse, and unlike many 3 phase meter solutions we've kept it simple, so you get the information you need, presented in an easily understood chart in seconds. 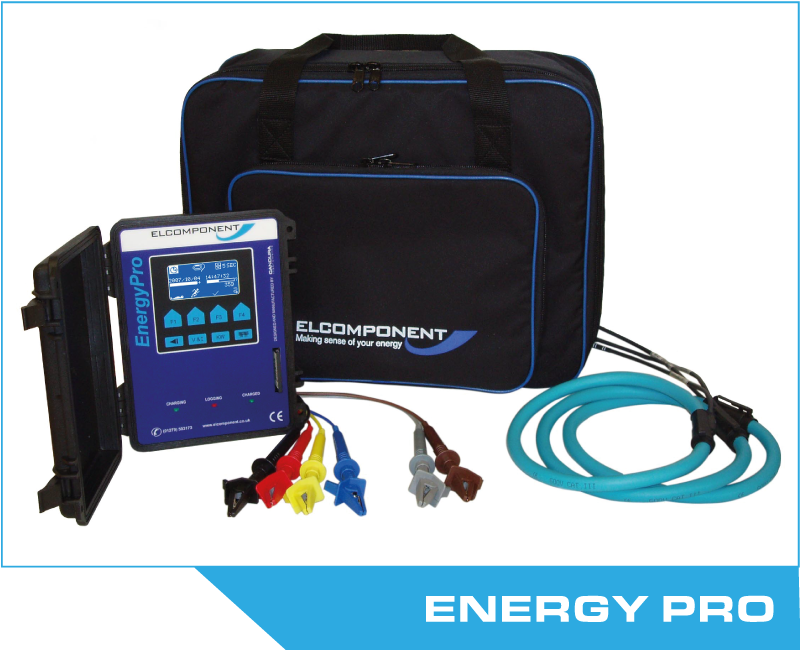 The Energy Pro is ideal where power quality may be an issue, or where measurements need to be made on highly distorted supplies where is will not only provide accurate results, but also provide the harmonics fingerprint and waveform characteristics of both the current and the voltage. It's designed for professional electricians and engineers who often need to acquire highly detailed levels of information, which is why the data logger ships with a huge 1GB memory card - enough for 7 days logging even at a 1 second storage rate, or well over 2 months at a 10 second interval! or fill out the form below and one of our customer services team will contact you!